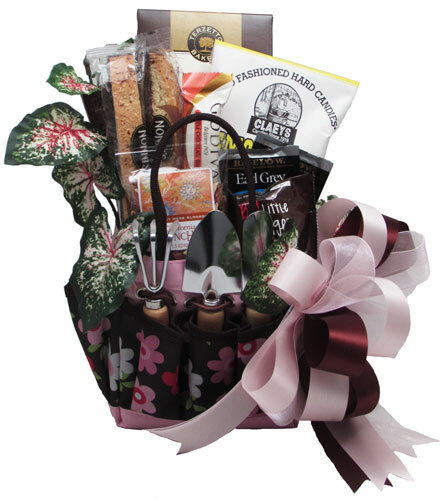 This pretty in pink garden tote comes complete with gardening tools (spade, trowel, and cultivator) and goodies! Filled with Chocolate Salted Caramel Cookies, Cocoa, Chocolate bottomed Biscotti, Godiva Chocolate Bar, Hard Candies (Assorted fruit), Almonds, Fudge, and Individually Wrapped Teabags. We add silk greenery, wrapped in crisp clear cellophane, and topped off with a beautiful handmade bow. Includes a Handwritten Greeting Card. Add balloons for $2 each.